Magic Ear® by Atomic Beam® | Official Site | If Words Are Unclear, You Need Magic Ear® by Atomic Beam®! Magic Ear® by Atomic Beam® adds a boost to your hearing, so you can hear a conversation from across the room. Hearing devices are obvious. Magic Ear® looks like a personal FM radio, so you can hear with confidence. Listen carefully. Want to be able to hear a pin drop from across the room? You need a device that gives you super hearing. READ FULL DESCRIPTION Introducing Magic Ear® by Atomic Beam®, the personal sound booster that gives you super hearing instantly. This new technology enhances vocals while canceling background noise. Magic Ear® by Atomic Beam® turns your environment from noisy to noise-free. It works so well, you can even hear a conversation from across the room! Now the conversation doesn't have to stop when you get in the car. Easily ear what's being said up front from the back seat! Family complaining you've got the TV turned up too loud? Magic Ear® by Atomic Beam® allows you to hear your show with the volume turned down low. It's the perfect gadget to use at the movie theater. Instantly filter out distracting background chatter and hear every word spoken in the movie. Wear Magic Ear® by Atomic Beam® on your hike and discover sounds the human ear normally wouldn't hear. It's perfect for hikers and sportsman, discovering new sounds. If words are unclear, you need Magic Ear® by Atomic Beam®! Get your Magic Ear® now for only $19.99 and get FREE shipping and handling. But wait! Double your offer and receive a SECOND Magic Ear®. Just pay a separate fee of $9.99. Hurry - this offer isn't available in stores. Order now! Get Super-Hearing Instantly - Hear A Conversation From Across The Room With Magic Ear® by Atomic Beam®! Easily picks up sounds that the human ear can't - perfect for hiking and sportsmen! 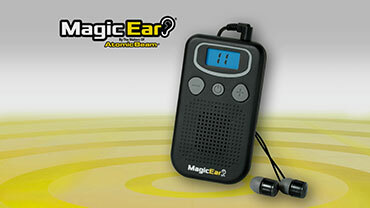 Magic Ear® by Atomic Beam® Works So Well, You Can Even Hear A Conversation From The Backseat of The Car! OFFER: Get your Magic Ear by Atomic Beam now for only $19.99 and get FREE shipping and handling. But wait! Double your offer and receive a SECOND Magic Ear. Just pay a separate fee of $9.99. Hurry - this offer isn't available in stores. Order now! UPGRADE to the Deluxe Magic Ear by Atomic Beam! Deluxe Magic Ear has a built-in rechargeable battery gives you reliable power without having to purchase batteries. Only $9.99/ea. Deluxe Magic Ear is unable to ship to PO Boxes. GUARANTEE: Your satisfaction is 100% guaranteed. If you are dissatisfied with your Magic Ear for any reason, simply return the product within 30 days for an easy refund of your purchase price, excluding shipping and handling. See our return policy for more information. Exceptions may apply.